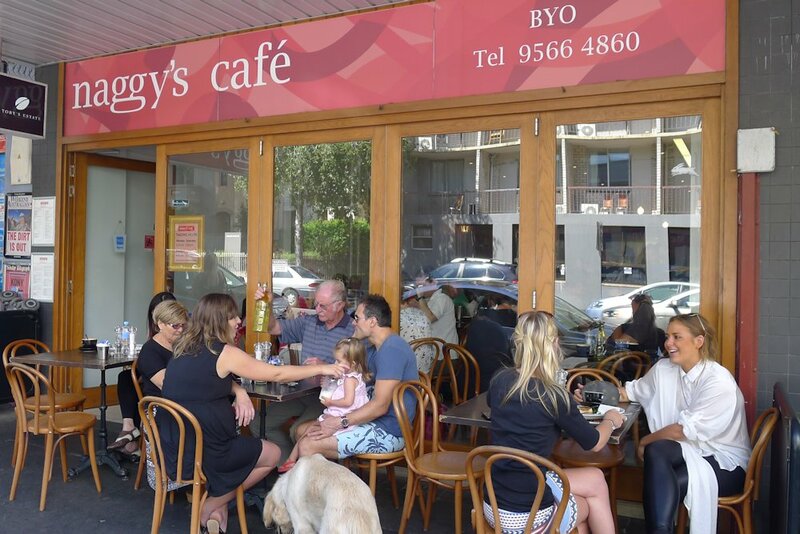 Naggy’s Café was bustling when we arrived mid-morning. Staff helped to locate a table quite quickly inside although I received an eye-roll when I asked for a fourth chair. Aside from the attitude of one young staff member, we found the rest of the wait staff to be quite courteous. We were served by a number of them though which meant sending three different people away within the first two or three minutes, all asking what we would like to order. The interior is quite large with plenty of seating. When a table became available outside though, we grabbed it and waited about 10 minutes or so before someone came to see us. There is no shortage of cold beverages on the menu. Fresh juices (orange, apple, pineapple, watermelon, carrot, celery, mint or ginger, $6.50), smoothies (banana, strawberry or mixed berry, $6), iced chocolate ($6), iced coffee/mocha ($6.50), milkshakes ($5.50) and thickshakes ($6.50). The selection of frappes include mango, mango & passionfruit and coffee. 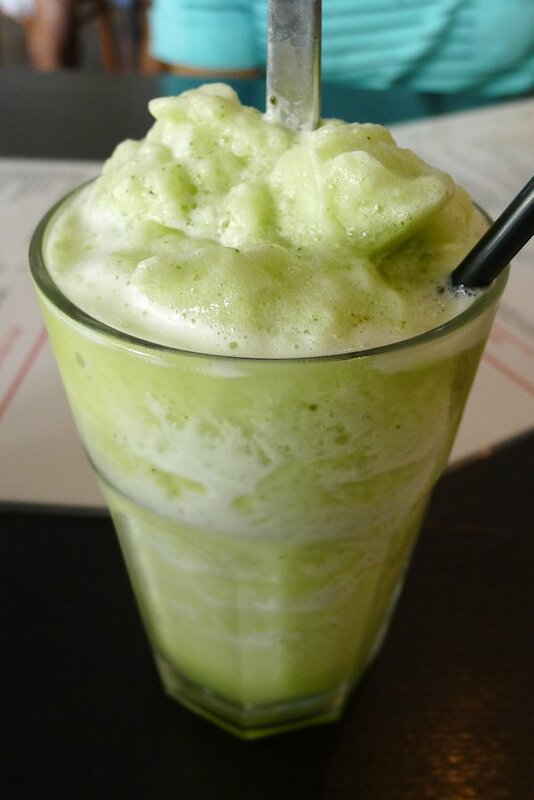 I tried the pineapple and mint frappe which had virtually no pineapple flavour – it was just mint and ice. We spoke to the waitress later and she said she had juiced it herself and the pineapple was in fact quite green and unripe hence the lack of flavour. No complaints from the coffee drinkers at our table either. 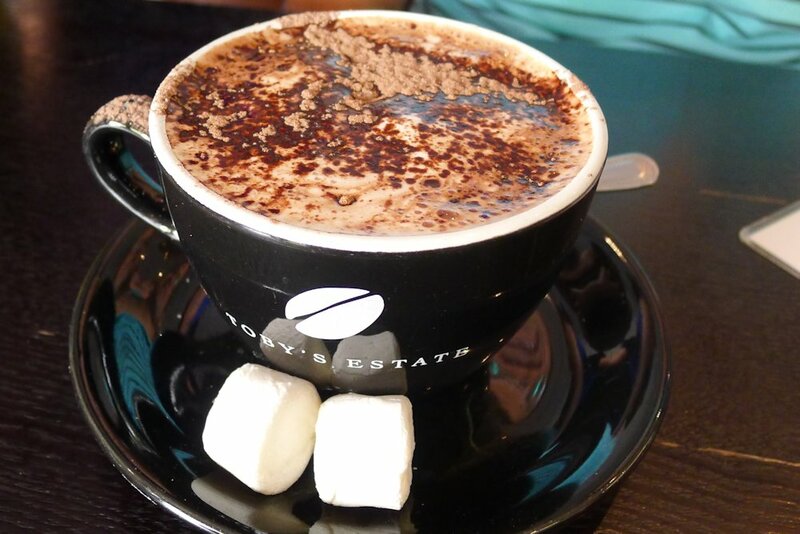 We have found Toby’s Estate to be hit & miss depending on where it’s served but this batch was strong and flavourful. 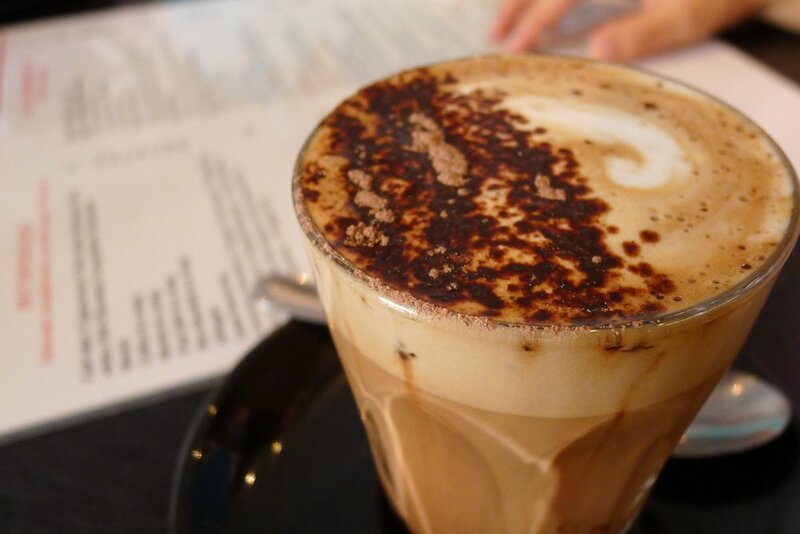 Our mocha ($3.30) and skim cappuccino ($3) impressed. The big breakfast ($15.90) was certainly sizeable. 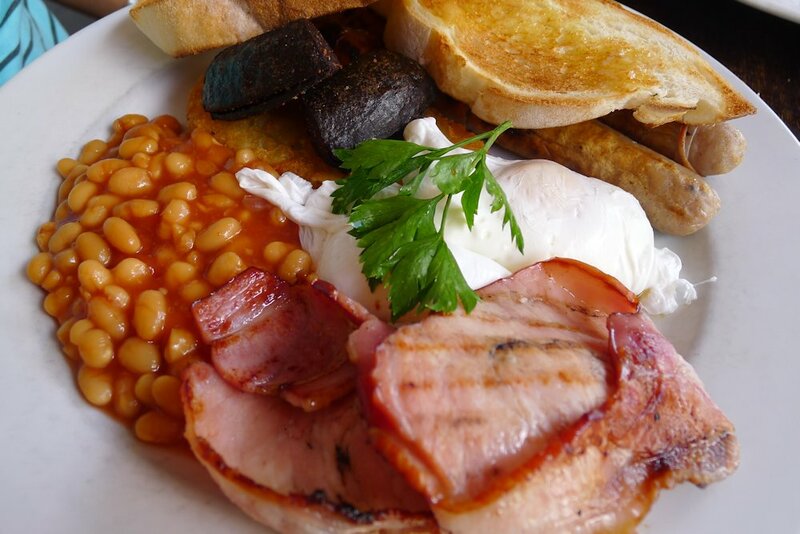 Two eggs are served any way with baked beans, pork sausages, bacon, black pudding, hash brown and wood fired toast. The bacon and eggs were cooked as well as can be expected but unfortunately there was not much else to be impressed with. The baked beans were from a can and not very memorable and the “wood fired toast” had no distinguishing flavour of being wood fired. Both the black pudding and pork sausages were very dry and the hash brown was soft and watery inside. 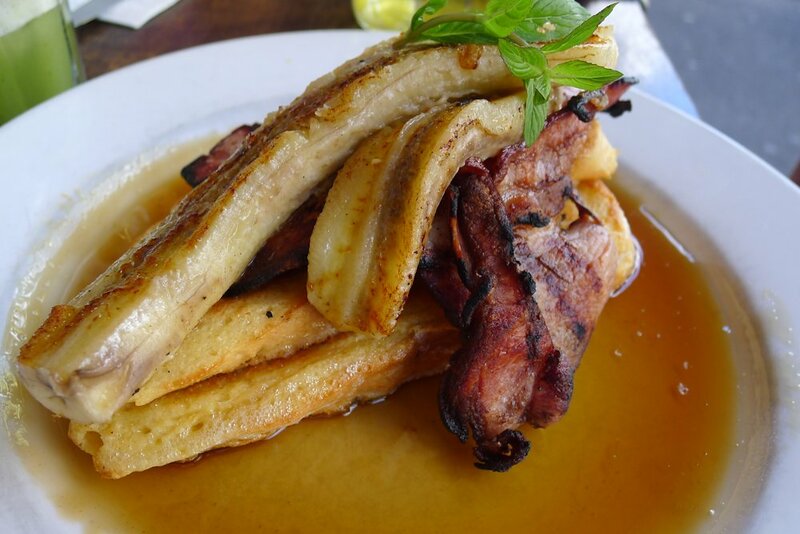 The “Traditional French toast” ($13.50) is served with grilled bacon, banana and a sea of maple syrup. Everything had been cooked as our guest liked it. The toast: well-soaked in egg, the banana slightly caramelised and the bacon, crispy. The presentation was also simple and this dish became the envy of the table. My breakfast sandwich ($10.50) certainly didn’t last long! 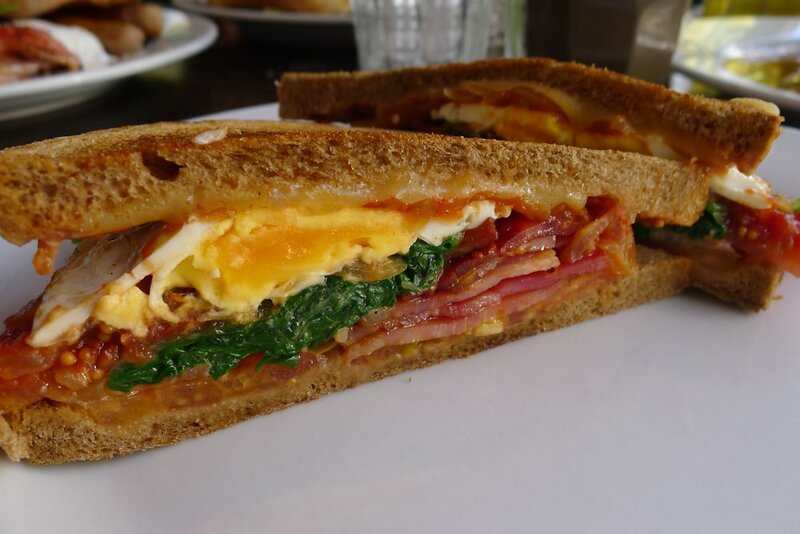 A tasty combination of flavours: fried egg, bacon, baby spinach, tomato relish and Swiss cheese. The relish was sweet and a nice contrast with the salty bacon. I would have preferred a slightly runny egg which I would request next time. Other than that, my only complaint is the layout of the sandwich. With one bite I was tasting two ingredients, with the next bite I would have another two. I would have preferred more even layers. So Naggy’s was quite a mixed bag when it came to the food, service, and drinks. The portions are great for the price although on review, our bill is more expensive than it should have been; they charged us for two big breakfasts instead of one. 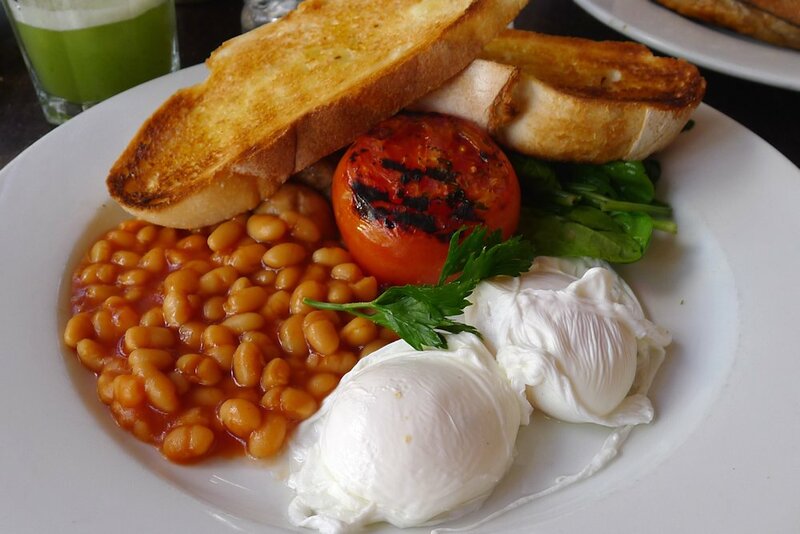 Other breakfasts include “eggs benedict“ on Turkish toast with spinach and mushroom ($12.90), shaved ham or bacon ($13.50) or smoked salmon ($14.50), three eggs omelette with three fillings ($13.90), porridge and fruit salad. 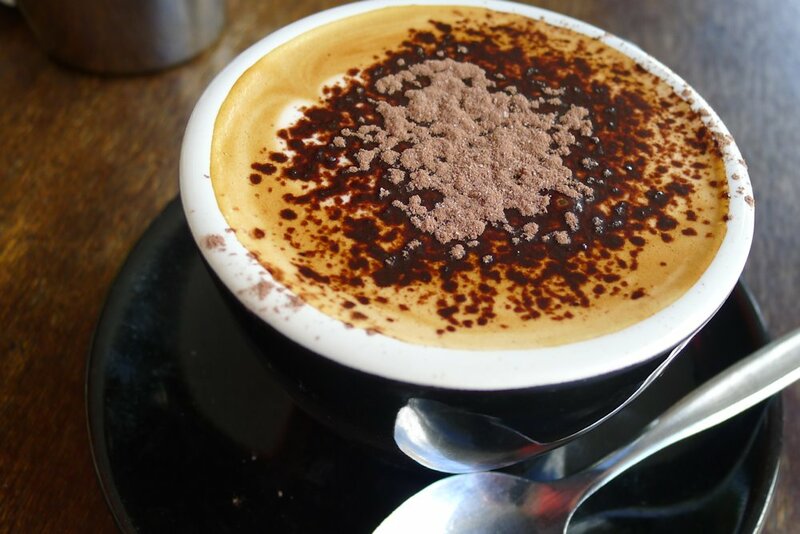 This entry was posted in Sydney - CBD, Sydney - Inner West and tagged Dog friendly, Fresh fruit and vegetable stores close by, Gluten free options, Outdoor seating, Reasonable prices. Bookmark the permalink.